A FLIGHT BETWEEN Paris and North Carolina has made an unscheduled landing at Dublin Airport after a pregnant woman went into premature labour on board. The Charlotte-bound flight is now on the ground in Dublin and the woman has been transferred by ambulance to the Rotunda Hospital. American Airlines have confirmed that the woman went into labour and that the flight was redirected to Dublin because of a “medical emergency”. It landed at about 1.45pm Irish time. The Dublin Airport Authority says that there was a doctor on board the flight who gave the woman medical attention before the plane landed and she was taken to hospital. The nationality of the woman and any further details about her condition are unknown at this time. 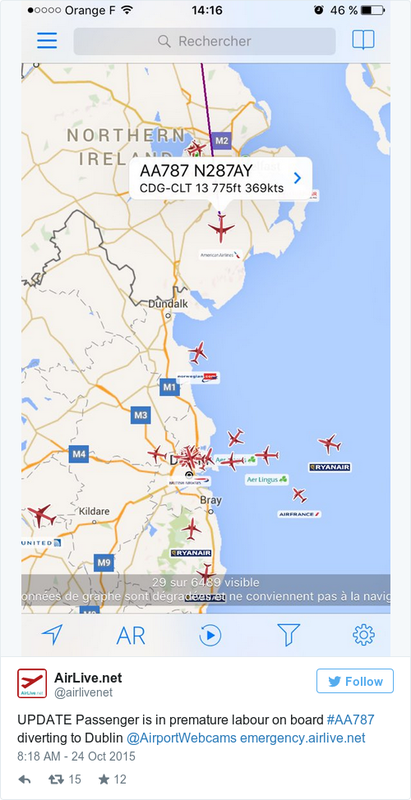 Email “Emergency landing at Dublin Airport after woman goes into premature labour on board”. Feedback on “Emergency landing at Dublin Airport after woman goes into premature labour on board”.